Most people seem to agree: 2016 was a terrible year. From a toxic presidential election to horrifying acts of domestic terrorism to the deaths of many beloved celebrities--including David Bowie, Prince, and Carrie Fisher--it's safe to say that many of us were pretty done with the year by the time it ended. But there were bright lights in 2016 that reminded us that humans can be creative, generous, kind, self-sacrificing, contrite, and forgiving. Here are ten of them. Many of us, me particularly, are from the units that have hurt you over the many years. We came. We fought you. We took your land. We signed treaties that we broke. We stole minerals from your sacred hills. We blasted the faces of our presidents onto your sacred mountain. When we took still more land and then we took your children and then we tried to make your language and we tried to eliminate your language that God gave you, and the Creator gave you. We didn't respect you, we polluted your Earth, we've hurt you in so many ways but we've come to say that we are sorry. We are at your service and we beg for your forgiveness. 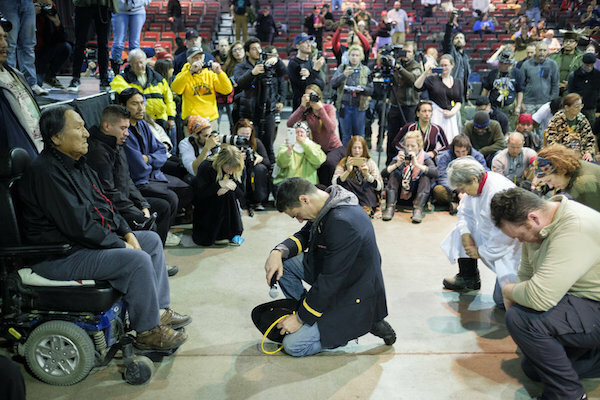 In the ceremony, Chief Leonard Crow Dog offered the veterans forgiveness. Learn more. This was about binding up the wounded. About showing compassion and empathy for the hurting and fearful among us. Or, in some Christian traditions, this was about washing my brother's feet. This was about my religion, not theirs. And, it was about what I think I must do as an American when our way of life is threatened. Targeting people for their religion not only threatens our way of life, it is the polar opposite of our way of life. 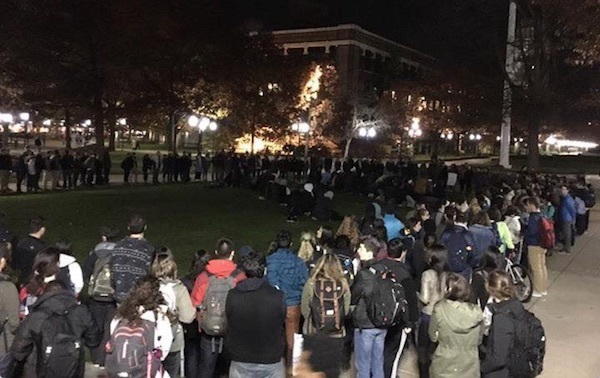 After November's election, Muslim students at the University of Michigan received death threats. In response, hundreds of students, faculty, and staff formed a circle around Muslim classmates who gathered to perform one of Islam's five daily prayers. Learn more. July 7 gave us one of the most awful moments of 2016, when Micah Xavier Johnson ambushed and killed five police officers in Dallas, Texas. A few days later, Black Lives Matter sponsored a small march in Dallas to protest police violence against unarmed black people. 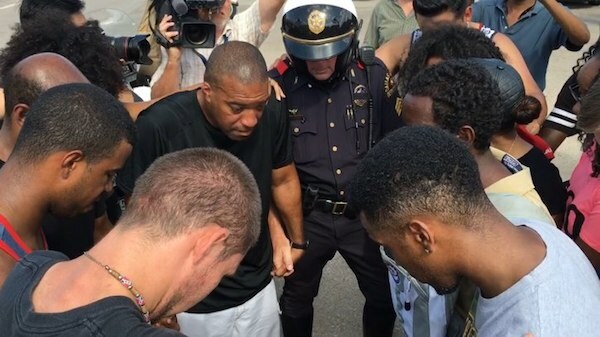 When they encountered counter-protesters waving American and Texas flags, a cop named Sgt. Jeff Hall successfully brought them together for a dialogue that ended in prayer. "I've seen a lot of protests, but I've never seen them come together like that," said Hall. "Makes me feel great to see people with such differences come together and work it out." Learn more. At the Junior Soccer World Challenge in Tokyo, Barcelona's under-12 team beat local favorites Omiya Ardija 1-0. In a show of good sportsmanship, the Spanish players sincerely and graciously consoled their distraught opponents. Learn more. That girl is the Olympic spirit right there. I went down and I was like 'what's happening? Why am I on the ground?' Then suddenly this hand on my shoulder, like 'get up, get up, we have to finish this' and I was like, 'yep, you're right'. This is the Olympic Games, we have to finish this... I've never met this girl before, and isn't that just so amazing, such an amazing woman. Regardless of the race and the result on the board, that's a moment that you're never ever going to forget for the rest of your life, that girl shaking my shoulder. At Paris Climate Conference in 2015, India agreed to reforest 12 percent of its land. 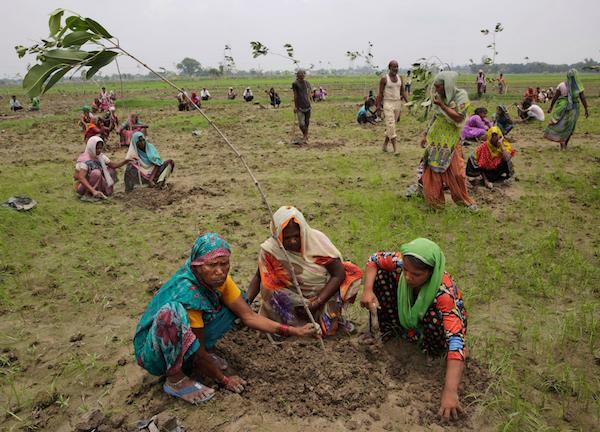 On one day this summer, 800,000 volunteers took a solid step in the direction of fulfilling that promise, by planting 50 million trees throughout the state of Uttar Pradesh. Learn more. In June, a man motivated by hatred of gays and lesbians killed 50 people and wounded 53 more in an Orlando nightclub. It was the worst mass shooting in the history of a country where gun massacres are depressingly common. 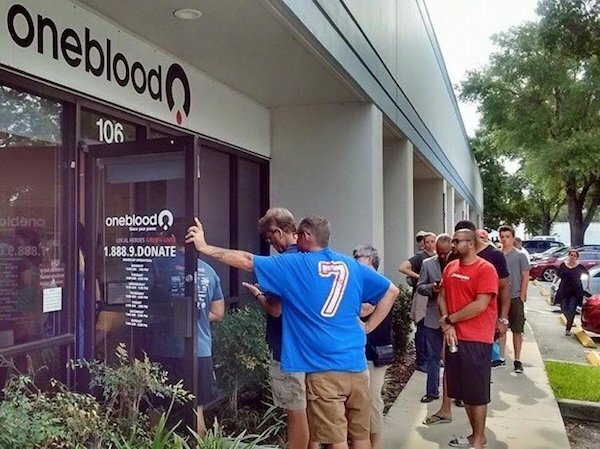 When blood for the survivors ran out, massive lines formed around banks across the city. According to BuzzFeed News, some areas were overloaded with donors. Learn more. Construction worker Jason Haney was helping to build a new section on the Memorial Children's Hospital of South Bend, Indiana. One day, he noticed the children (who all suffer from debilitating and even terminal conditions) in the wing across the street watching their work. 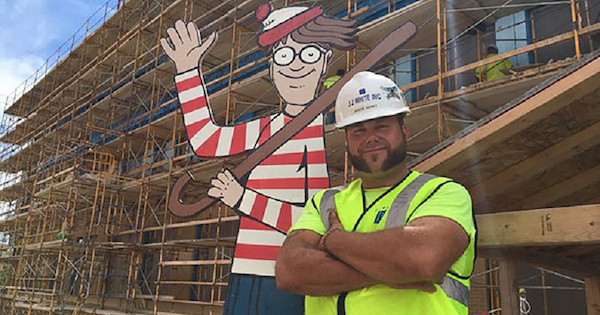 So, he created an eight-foot-tall wooden Waldo that he'd put in a different spot every few days on the construction site. Soon, the kids were racing to the windows to play "Where's Waldo?" Learn more. Green Beret Sgt. Joseph Serna did four combat tours in Afghanistan, where he was almost killed three times. On returning to the United States, he was diagnosed with post-traumatic stress disorder, and he was arrested repeatedly on charges related to drugs and drinking, including drunk-driving. 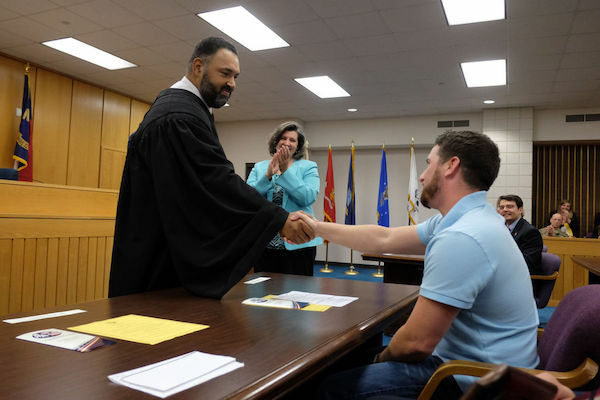 On the 25th time he came before North Carolina District Court Judge Lou Olivera, Olivera sentenced Serna to one day in jail--and personally drove him there. "When Joe first came to turn himself in, he was trembling," Olivera told the Fayetteville Observer. "I decided that I'd spend the night serving with him." Learn more.